Brilliant debut album from an international parade of popstars featuring 13 wonderfully eclectic songs about love and travel recorded between San Francisco and Melbourne over a period of a year. Heartfelt lyrics and ace vocals courtesy of The Lucksmiths Tali White, paired with music from a truly collaborative cast including members of The Lucksmiths, Sodastream, Poundsign, The Fairways, The Aislers Set, Red Raku, Art of Fighting, The Killjoys, and Blackeyed Susans. Highlights include the jangling-guitar travelogue "Jet-Set...Go!" which takes in Spain, Yorkshire, Las Vegas and Thailand before its joyous finale in San Francisco..."The Photographer," a strum and bass still life memory of a sea-side moment sung over a loping, looping bass line, with layers of acoustic guitars and frantic drums... and "Siamese Couplets", a lazy hip-hop/pop tune with junky percussion, a soaring chorus and lyrics that attempt to capture the sensory overload of south east Asia while maintaining the distinction of being the first and possibly last song on Matinée to be rapped! 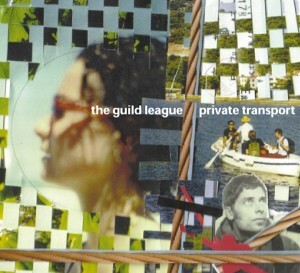 From odes to breakfast and London to stripped-back heart breakers and instrumental laments, "Private Transport" is a refreshingly diverse album that exceeds the potential of such a distinguished cadre.